Long regarded as a representative of endangered species everywhere, China's bamboo-loving giant panda, which was already considered rare in the country's antiquity, is even rarer today. Destruction and fragmentation of its montane forest habitat as a result of encroaching human civilization has contributed to the decline of this bear species, which can be identified by its black-and-white color scheme. Dispersed throughout southern and eastern China in historic times, the surviving population of giant pandas is confined to an area measuring approximately 11,583 square miles in the country's south-central region. Of this range, only 2,278 square miles offer the right kind of habitat to support the species. The species' current range encompasses parts of three provinces: Gansu, Shaanxi and Sichuan. 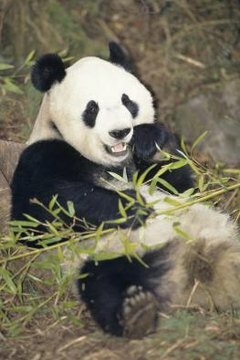 The majority of the remaining giant pandas live in the Minshan Mountains of Gansu and Sichuan provinces, though they are also found in smaller numbers in the Qinling Mountains of Shaanxi province. Their populations are further divided into 20 or so patches of habitat, which hinders breeding and limits the giant pandas' access to food. Giant pandas live in mixed broadleaf and coniferous forests between elevations of 4,000 and 13,000 feet. These temperate forests are either enveloped by mist or subject to downpours most of the year. Due to their highly specialized dietary requirements -- they eat bamboo almost exclusively and one panda may consume as much as 45 pounds of it a day -- giant pandas require an abundant bamboo forest understory in order to survive. Giant pandas consume around 60 species of bamboo, with 35 species accounting for most of their diet. Even though bamboo has a high water content, giant pandas must have access to a stream or other source of water. Unlike most other bear species, giant pandas do not spend their winters in hibernation. Instead they tend to travel to lower elevations in the winter in search of warmer temperatures. In the summertime they move to higher ground, where it is cooler. Giant pandas do not establish home dens or defend territories; they will sleep in any hollow tree or cave they find convenient. They are also excellent tree climbers and able swimmers. Except during breeding season and when mothers are caring for their cubs, giant pandas tend to be solitary. While adult pandas do not really have natural predators, cubs and juveniles may fall prey to carnivores like the snow leopard, the Asiatic golden cat and the yellow-throated marten. What Is the Claw on a Panda's Front Paw Used For?